You'll find older editions of our newsletter on web-DENIS. Log in and go to BCN Provider Publications and Resources and look for BCN Provider News. Are you new to BCN Provider News? 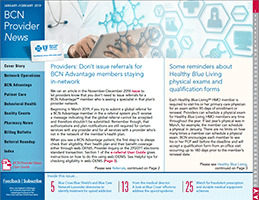 Find out how to use our newsletter in the BCN Provider News User Guide (PDF). Do you have comments or suggestions about our newsletter? Send us an email at bcnprovidernews@bcbsm.com. The Best Practices Library is a collection of practice profiles from BCN Provider News. These articles feature providers who have met high standards for patient care. © 2018 - Blue Care Network is a nonprofit corporation and independent licensee of the Blue Cross and Blue Shield Association.